Superboy is flying to leave Metropolis for good. His reasons for this stem from the events of recent days. Billy Cramer has matured quite a bit since learning that Clark is Superboy. The Boy of Steel even feels more free to talk to Billy now that the truth is out. He'd even given his new friend a supersonic whistle that only Superboy can hear. This helps the Last Son of Krypton save those he probably would not have rescued without Billy's aid. However, things are not all wine and roses for young Clark Kent. Lori Lemaris still won't tell him why she must always leave him at 8:00 PM every night, and worse yet, she'll be returning home to her family for good. 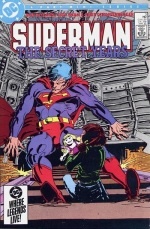 Superboy will have to work fast if he is to solve the mysteries of the life of Lori Lemaris. Tensions have arisen with Clark Kent and his friends. Pete Ross has come to town to watch a basketball game and visit Clark, who is unaware that his high school chum knows he is Superboy. The fact that both Billy and Pete are unwittingly trying to keep Clark's double life a secret creates jealousy and rivalry between the two lads. Saving a fireworks factory from burning turns out to be less tiresome than going with his pals to a match for the Teen of Tomorrow. Plus, our young hero discovers Lori is talking to someone via radio. The only other unusual thing in her trailer is a tank of sea water where a bed should be. 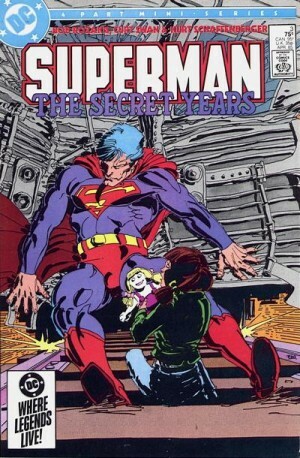 Superboy may get the shock of his life should he discover that his girlfriend is an enemy agent. In spite of now knowing that Lori is a telepathic mermaid from Atlantis, Clark is gravely hurt because she must return home even though they worked together to save innocent people from a flood. Billy wishes to help the mild mannered student after calling Superboy with the supersonic whistle, but he angrily shuts him out in both of his identities. Clark simply refuses to discuss his feelings with anyone. Has Superboy's broken heart created a rift between him and Billy Cramer? A tsunami is about to hit the island of Pandango. Rioters are preventing aid from getting to women and children. As the Boy of Steel makes his rescue attempts, Billy blows the supersonic whistle. He is trapped in a burning building in Metropolis. He went in to help get a woman's baby out of the flames. Firemen later discover that the child was with a neighbor. Meanwhile, Superboy's super breath only strengthens the tidal wave, and heat vision will scorch the inhabitants. Superboy's only option is to go under water burn part of the island that's underwater and lift Pandango to another location. As he does this, Billy continues to blow the whistle. However, the blaze and its smoke overcome him. When Superboy returns to Metropolis, CPR does not help Billy Cramer. He is dead. Now, Superboy believes that because he has been unable to save his friends and family, being a superhero is not worth the effort. He now wants to hang up his cape for good as he pays his final respects to Billy Cramer. Story - 3: In all honesty, this was edging close to a four as Bob Rozakis did seem to fix problems evident in the previous two chapters. Yet, while the story was a more interesting and entertaining read, there are still some things that could have been handled better. For example, I like the fact that Billy seems to have matured somewhat since Clark told him he is Superboy. However, he seems to have changed or evolved as a character without much, if any, explanation. It's as sudden as Clark revealing his secret identity in the previous issue and comes out of nowhere. Still, it's good to see he's not an irritating borderline stalker even if my prediction of his death came true. We got more of Lori Lemaris, and Pete Ross finally makes an appearance in this series. The rivalry between him and Billy is done well. However, I would have liked to have seen Lana Lang in this issue. Her reactions to Clark's friendship with Billy and romance with Lori could have provided some interesting drama in young Mister Kent's life. That in addition to more delving into the aforementioned character development of Billy would have made for a perfect comic. I understand DC and Marvel are competitors. That's just normal in the comic book business. I like both Marvel and DC equally. However, certain elements in Bob Rozakis' story seem to be going in the direction of the Stan Lee and John Romita Senior classic "Spider-Man No More" from The Amazing Spider-Man #50. At this point in the mini-series, I'm not certain if I like that. We'll just have to wait and see how the rest of this pans out in the next issue. In the past two to three years, I've been re-acquainting myself with Doctor Who. I love the revival show, and I have been watching the classic series a bunch lately. I've even had reviews published in the Fish Fingers and Custard fanzine (Shameless plug). What's my point? Well, the supersonic whistle Billy used to call Superboy reminded me of the dog whistle Tom Baker used as the fourth incarnation of the Doctor to call the robot dog K-9. I had qualms about this plot device upon my first reading of this book, but I warmed up to as I saw it in my second and third perusals. The whistle gave a bit of Silver/Bronze Age whimsy to the story. That helped me to enjoy it more. While there was room for improvement, Superman: The Secret Years #3 is perhaps the best of this series so far. This is what I expected from the previous two issues. We'll see how things wrap up eventually, but I'm not as cynical about this story as I was before. Art - 4: Again, it just tells the story, but Curt Swan did a fantastic job with what he does best - drawing the Superman universe. Still, the inks prevent the art from being a perfect five. Something about them feels out of sync with Swan's style. Cover Art - 1: This image, like the ones for the first two chapters, does the exact opposite of what a comic book cover should do. I personally feel it was a horrible choice as it repulses the viewer instead of attracting them to buy it.